THE KINKS: MISFITS: 1978: 4 STARS OUT OF 5 STARS: The first album by The Kinks that I owned. I had heard Rock And Roll Fantasy- a minor hit- and went out and bought the album. Misfits, Live Life, Get Up and Dave Davies Trust Your Heart- my favorites on it. The Kinks most rocking album in the 70’s. SQUEEZE: EAST SIDE STORY: 1981: 5 STARS OUT OF 5 STARS: When I heard Elvis was one of the producers of the album I bought it-having heard nothing from it yet. Well I may have heard Tempted. Chris Difford and Glenn Tilbrook were being billed as the Lennon-McCartney of the early 80’s- they are gifted writers. A great pop album- Tempted which was sung by Paul Carrack was the hit on the album. 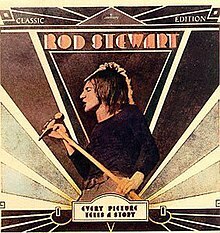 ROD STEWART: EVERY PICTURE TELLS A STORY: 1971: 5 STARS OUT OF 5 STARS: Rod was never better- in my opinion at least his best album. Not only Maggie May but well the entire album-he only had a hand in writing three of the ten songs but all of the songs sound like his own. If Rod had only stayed on this course. 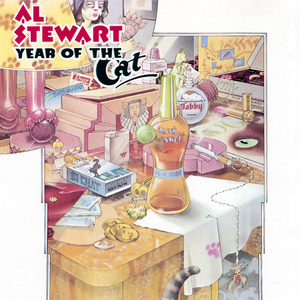 AL STEWART : YEAR OF THE CAT: 1976: 5 STARS OUT OF 5 STARS: It seems like this week in albums I’ve been listening to- I’ve written a few times- their 7th album and break through album. Here is another- Stewart hadn’t charted a single in the US until Year Of The Cat- and this was his first large selling album also. I am not huge into Stewart- I have this album and Time Passages plus a two disc ‘best of”- I like that his subject matter at times is different from everyone else- especially his songs about historical events. THE HOLLIES: GREATEST HITS: 1973: 4 1/2 STARS OUT OF 5 STARS: A dozen songs/ hits from The Hollies- infectious pop music. A double disc best of has come along since this. The Air That I Breathe came along after this greatest hits so it’s not included on here. 5 of these songs hit the top 10. Underappreciated group. Every Picture Tells a Story… I love the way he combined the acoustic with everything…I wish he would have done that more often. The title track is one of my favorite songs. I knew some of those songs were covers- but I didn’t realized 7 of the 10 were- I think 3 of the top 4 songs on the album- were his but of course the album was strong from start to finish. It was strong…I didn’t realize that many were covers. Ron Wood was an underrated bass player. He did some great work especially on Maggie May. He had great musicians backing him for sure.. I’m Losing You- he takes that song- and makes me forget it was first done by The Temptations.